The Norman conquest of England was the invasion of the Kingdom of England by William the Conqueror (Duke of Normandy), in 1066 at the Battle of Hastings and the subsequent Norman control of England. It is an important watershed event in English history for a number of reasons. The conquest linked England more closely with Continental Europe through the introduction of a Norman aristocracy, thereby lessening Scandinavian influence. It created one of the most powerful monarchies in Europe and engendered a sophisticated governmental system. The conquest changed the English language and culture, and set the stage for rivalry with France, which would continue intermittently until the nineteenth century. It remains the last successful military conquest of England. Normandy is a region in northwest France, which in the 155 years prior to 1066 experienced extensive Viking settlement. In the year 911, French Carolingian ruler Charles the Simple had allowed a group of Vikings, under their leader Rollo, to settle in northern France with the idea that they would provide protection along the coast against future Viking invaders. This proved successful and the Vikings in the region became known as the "Northmen," from which Normandy is derived. The Normans quickly adapted to the indigenous culture, renouncing paganism and converting to Christianity. They adopted the langue d'oïl of their new home and added features from their own Norse language, transforming it into the Norman language. They further blended into the culture by intermarrying with the local population. They also used the territory granted them as a base to extend the frontiers of the Duchy to the west, annexing territory including the Bessin, the Cotentin Peninsula, and the Channel Islands. Meanwhile, in England the Viking attacks increased, and in 991 the Anglo-Saxon king of England Aethelred II agreed to marry Emma, the daughter of the Duke of Normandy, to cement a blood-tie alliance for help against the raiders. The Viking attacks in England grew so bad that in 1013, the Anglo-Saxon kings fled and spent the next 30 years in Normandy, not returning to England until 1042. When the Anglo-Saxon king Edward the Confessor died a few years later in 1066 with no child, and thus no direct heir to the throne, it created a power vacuum into which three competing interests laid claim to the throne of England. The first was Harald III of Norway, based on a supposed agreement between the previous King of Norway, Magnus I of Norway, and Harthacanute, whereby if either died without heir, the other would inherit both England and Norway. The second claimant to the English throne was William, Duke of Normandy because of his blood ties to Aethelred. The third was an Anglo-Saxon by the name of Harold Godwinson who had been elected in the traditional way by the Anglo-Saxon Witenagemot of England to be king. The stage was set for a battle among the three. King Harald of Norway invaded northern England in September 1066, which left Harold of England little time to gather an army. Harold's forces marched north from London and surprised the Vikings at the Battle of Stamford Bridge on September 25. In the Anglo-Saxon victory, King Harald was killed and the Norwegians were driven out. It was the last Viking invasion of England. The victory came at great cost, as the Anglo-Saxon army was left in a battered and weakened state. Meanwhile William had assembled an invasion fleet of approximately 600 ships and an army of 7000 men. This was far greater than the reserves of men in Normandy alone. William recruited soldiers from all of Northern France, the low countries, and Germany. Many soldiers in his army were second- and third-born sons who had little or no inheritance under the laws of primogeniture. William promised that if they brought their own horse, armor, and weapons to join him, they would be rewarded with lands and titles in the new realm. After being delayed for a few weeks by unfavorable weather, he arrived in the south of England just days after Harold's victory over the Norwegians. The delay turned out to be crucial; had he landed in August as originally planned, Harold would have been waiting with a fresh and numerically superior force. William finally landed at Pevensey in Sussex on September 28, 1066, and assembled a prefabricated wooden castle near Hastings as a base. The choice of landing was a direct provocation to Harold Godwinson, as this area of Sussex was Harold's own personal domain. William began immediately to lay waste to the land. It may have prompted Harold to respond immediately and in haste rather than to pause and await reinforcements in London. Again, it was an event that favored William. Had he marched inland, he may have outstretched his supply lines, and possibly have been surrounded by Harold's forces. They fought at the Battle of Hastings on October 14. It was a close battle but in the final hours Harold was killed and the Saxon army fled. With no living contender for the throne of England to oppose William, this was the defining moment of what is now known as the Norman Conquest. After his victory at Hastings, William marched through Kent to London, but met fierce resistance at Southwark. He then marched down the old Roman Road of Stane Street to link up with another Norman army on the Pilgrims' Way near Dorking, Surrey. The combined armies then avoided London altogether and went up the Thames valley to the major fortified Saxon town of Wallingford, Oxfordshire, whose Saxon lord, Wigod, had supported William's cause. While there, he received the submission of Stigand, the Archbishop of Canterbury. One of William's favorites, Robert D'Oyley of Lisieux, also married Wigod's daughter, no doubt to secure the lord's continued allegiance. William then traveled north east along the Chiltern escarpment to the Saxon fort at Berkhamstead, Hertfordshire, and waited there to receive the submission of London. The remaining Saxon noblemen surrendered to William there, and he was acclaimed King of England around the end of October and crowned on December 25, 1066, in Westminster Abbey. Although the south of England submitted quickly to Norman rule, resistance continued, especially in the North. After six years William moved north in 1072, subduing rebellions by the Anglo-Saxons and installing Norman lords along the way. However, particularly in Yorkshire, he made agreements with local Saxon Lords to keep control of their land (under Norman-named Lords who would "hold" the lands only from a distance) in exchange for avoidance of battle and loss of any controlling share. Hereward the Wake led an uprising in the fens and sacked Peterborough in 1070. Harold's sons attempted an invasion of the south-west peninsula. Uprisings also occurred in the Welsh Marches and at Stafford. William faced separate invasion attempts by the Danes and the Scots. William's defeat of these led to what became known as The Harrying of the North in which Northumbria was laid waste to deny his enemies its resources. Many of the Norman sources which survive today were written in order to justify their actions, in response to Papal concern about the treatment of the native English by their Norman conquerors. The conquest of Wales was a gradual process, concluded only in 1282 during the reign of King Edward I. Edward also subdued Scotland, but did not truly conquer it; it retained a separate monarchy until 1603, and did not formally unite with England until 1707. Once England had been conquered the Normans faced many challenges in maintaining control. The Anglo-Norman speaking Normans were in very small numbers compared to the native English population. Historians estimate their number at 5,000 armored knights. The Anglo-Saxon lords were accustomed to being independent from centralized government, contrary to the Normans, who had a centralized system resented by the Anglo-Saxons. Revolts had sprung up almost at once, from the time of William's coronation, led either by members of Harold's family or disaffected English nobles. William dealt with these challenges in a number of ways. New Norman lords constructed a variety of forts and castles (such as the motte-and-bailey) to provide a stronghold against a popular revolt (or increasingly rare Viking attacks) and to dominate the nearby town and countryside. Any remaining Anglo-Saxon lords who refused to acknowledge William's accession to the throne or who revolted were stripped of titles and lands, which were then re-distributed to Norman favorites of William. If an Anglo-Saxon lord died without issue the Normans would always choose a successor from Normandy. In this way the Normans displaced the native aristocracy and took control of the top ranks of power. Absenteeism became common for Norman (and later Angevin) kings of England, for example William spent 130 months from 1072 onward in France rather than in England, using writs to rule England. This situation lasted until the Capetian conquest of Normandy. This royal absenteeism created a need for additional bureaucratic structures and consolidated the English administration. Kings were not the only absentees since the Anglo-Norman barons would use the practice too. Keeping the Norman lords together and loyal as a group was just as important, as any friction could easily give the English speaking natives a chance to divide and conquer their minority Anglo-French speaking lords. One way William accomplished this was by giving out land in a piece-meal fashion. A Norman lord typically had property spread out all over England and Normandy, and not in a single geographic block. Thus, if the lord tried to break away from the King, he could only defend a small number of his holdings at any one time. This proved an effective deterrent to rebellion and kept the Norman nobility loyal to the King. Over the longer term, the same policy greatly facilitated contacts between the nobility of different regions and encouraged the nobility to organize and act as a class, rather than on an individual or regional base which was the normal way in other feudal countries. The existence of a strong centralized monarchy encouraged the nobility to form ties with the city dwellers, which was eventually manifested in the rise of English parliamentarianism. William disliked the Anglo-Saxon Archbishop of Canterbury, Stigand, and in 1070 maneuvered to replace him with the Italian Lanfranc and proceeded to appoint Normans to church positions. The changes that took place because of the Norman Conquest were significant for both English and European development. One of the most obvious changes was the introduction of the Latin-based Anglo-Norman language as the language of the ruling classes in England, displacing the Germanic-based Anglo-Saxon language. Anglo-Norman retained the status of a prestige language for nearly 300 years and has had a significant influence on modern English. It is through this, the first of several major influxes of Latin or Romance languages, that the predominant spoken tongue of England began to lose much of its Germanic and Norse vocabulary, although it retained Germanic sentence structure in many cases. Even before the Normans arrived, the Anglo-Saxons had one of the most sophisticated governmental systems in Western Europe. All of England had been divided into administrative units called shires of roughly uniform size and shape, and were run by an official known as a "shire reeve" or "sheriff." The shires tended to be somewhat autonomous and lacked coordinated control. Anglo-Saxons made heavy use of written documentation, which was unusual for kings in Western Europe at the time and made for more efficient governance than word of mouth. The Anglo-Saxons also established permanent physical locations of government. Most medieval governments were always on the move, holding court wherever the weather and food or other matters were best at the moment. This practice limited the potential size and sophistication of a government body to whatever could be packed on a horse and cart, including the treasury and library. The Anglo-Saxons established a permanent treasury at Winchester, from which a permanent government bureaucracy and document archive had begun to grow. This sophisticated medieval form of government was handed over to the Normans and grew even stronger. The Normans centralized the autonomous shire system. The Domesday Book exemplifies the practical codification which enabled Norman assimilation of conquered territories through central control of a census. It was the first kingdom-wide census taken in Europe since the time of the Romans, and enabled more efficient taxation of the Norman's new realm. Systems of accounting grew in sophistication. A government accounting office, called the exchequer, was established by Henry I; from 1150 onward this was located in Westminster. Anglo-Norman and French political relations became very complicated and somewhat hostile after the Norman Conquest. The Normans still retained control of the holdings in Normandy and were thus still vassals to the King of France. At the same time, they were the equals as King of England. On the one hand they owed fealty to the King of France, and on the other hand they did not, as they were peers. In the 1150s, with the creation of the Angevin Empire, the Plantagenets controlled half of France and all of England as well as Ireland, dwarfing the power of the Capetians. Yet the Normans were still technically vassals to France. A crisis came in 1204 when the French king Philip II seized all Norman and Angevin holdings in mainland France except Gascony. This would later lead to the Hundred Years War when Anglo-Norman English kings tried to regain their dynastic holdings in France. During William's lifetime, his vast land gains were a source of great alarm by not only the king of France, but the counts of Anjou and Flanders. Each did his best to diminish Normandy's holdings and power, leading to years of conflict in the region. One interpretation of the Conquest maintains that England became a cultural and economic backwater for almost 150 years. Few kings of England actually resided for any length of time in England, preferring to rule from cities in Normandy such as Rouen and concentrate on their more lucrative French holdings. Indeed, a mere four months after the Battle of Hastings, William left his brother-in-law in charge of the country while he returned to Normandy. The country remained an unimportant appendage of Norman lands and later the Angevin fiefs of Henry II. Another interpretation is it that the Norman duke-kings neglected their continental territories, where they in theory owed fealty to the kings of France, in favor of consolidating their power in their new sovereign realm of England. The resources poured into the construction of cathedrals, castles, and the administration of the new realm arguably diverted energy and concentration away from the need to defend Normandy, alienating the local nobility and weakening Norman control over the borders of the territory, while simultaneously the power of the kings of France grew. The eventual loss of control of continental Normandy divided landed families as members chose loyalty over land or vice-versa. A direct consequence of the invasion was the near total loss of Anglo-Saxon aristocracy, and Anglo-Saxon control over the Church in England. As William subdued rebels, he confiscated their lands and gave them to his Norman supporters. By the time of the Domesday Book, only two English landowners of any note had survived the displacement. By 1096, no church See or Bishopric was held by any native Englishman; all were held by Normans. No other medieval European conquest had such devastating consequences for the defeated ruling class. Meanwhile, William's prestige among his followers increased tremendously as he was able to award them vast tracts of land at little cost to himself. His awards also had a basis in consolidating his own control; with each gift of land and titles, the newly created feudal lord would have to build a castle and subdue the natives. Thus was the conquest self-perpetuating. The extent to which the conquerors remained ethnically distinct from the native population of England varied regionally and along class lines, but as early as the twelfth century the Dialogue on the Exchequer attests to considerable intermarriage between native English and Norman immigrants. Over the centuries, particularly after 1348 when the Black Death pandemic carried off a significant number of the English nobility, the two groups largely intermarried and became barely distinguishable. The Norman conquest was the the last successful "conquest" of England, although some historians identify the Glorious Revolution of 1688 as the most recent successful "invasion." The last full scale invasion attempt was by the Spanish Armada, which was defeated at sea by the Royal Navy and the weather. Napoleon and Hitler both prepared invasions of Great Britain, but neither was ever launched (for Hitler's preparations see Operation Sealion). Some minor military expeditions to Great Britain were successful within their limited scope, such as the 1595 Spanish military raid on Cornwall, small scale raids on Cornwall by Arab slavers in the seventeenth and eighteenth centuries, the Dutch raid on the Medway towns' shipyards in 1667, and the American raid on Whitehaven during the American Revolutionary War. For the importance of the concept in mass culture, note the spoof history book 1066 and All That as well as the iconic status of the Bayeux Tapestry. Similar conquests include the Norman conquests of Apulia and Sicily (see Two Sicilies), the Principality of Antioch, and Ireland. 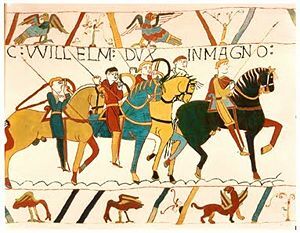 History of "Norman conquest of England"
This page was last modified on 10 December 2018, at 16:46.